The way the property was constructed. It was nice. My room was good. The open shower . The closet all good. But was not maintained well. Room was spacious. Bathroom was well kept. Shower was nice with plenty of hot water. The room arrangement , facilities and ambience are par excellence. Beautiful resort in a calm corner by the sea. Very good facilities, good food and courteous service. Had a very enjoyable stay with my family over the republic day weekend. Check in was simple. The staff was cooperative, the food was good and the rooms was spacious, neat and clean. The swimming pools were clean and maintained well. Overall value for money. The elegant villas feature modern interiors, floor-to-ceiling windows and hardwood floors. Each well-furnished unit includes a cable TV, a cozy sitting area and a private bathroom with a shower. Bathrobes and a hairdryer are included. The Windflower Resort is 5 miles from Vinayaga Temple, Pondicherry Train Station and Pondicherry Bus Station. Guests can practice yoga, or enjoy relaxing massages and body treatments at the spa. Meeting and banquet facilities are also available upon request. Free Wi-Fi is provided in public areas of the property. The restaurant serves a fine selection of local and international fresh seafood dishes. 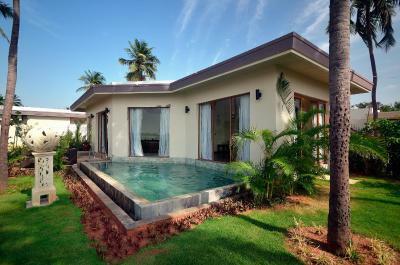 When would you like to stay at The Windflower Resorts and Spa pondicherry? This studio features a cable TV, a sitting area and a private bathroom with shower facilities. Elegant suites feature modern interiors, mini-bar, floor-to-ceiling windows and wooden flooring. Each well-appointed unit is equipped with a cable TV, cozy seating area and private bathroom with a shower. Bathrobes and a hairdryer are included. The room offers a private sit out overlooking backwaters. These elegant villas feature modern interiors, a minibar, floor-to-ceiling windows, hardwood floors and a private pool. Each well-furnished unit includes a cable TV, cozy sitting area and a private bathroom with a spa bathtub and shower. Bathrobes and a hairdryer are included. Studio features a cable TV, seating area and private bathroom with shower facilities. It also offers a balcony. Elegant suite feature modern interiors, mini-bar, floor-to-ceiling windows and wooden flooring. Each well-appointed unit is equipped with a cable TV, cozy seating area and private bathroom with a spa bath and shower. Bathrobes and a hairdryer are included. Guests can enjoy the views of garden and sea. Set in picturesque Little Veerampattinam, the Windflower Pondicherry is perched between backwaters and bright blue ocean. Stroll along the beach, if the mood strikes you. Race the gulls to the horizon. Step around seashells, and spider crabs. Watch the sun set into the Indian Ocean. Or, take a romantic little cruise along the backwaters. Have a quiet picnic lunch on the banks of a stream. Walk about shooting the birds on film. Come, take advantage. House Rules The Windflower Resorts and Spa pondicherry takes special requests – add in the next step! The Windflower Resorts and Spa pondicherry accepts these cards and reserves the right to temporarily hold an amount prior to arrival. Please note that all Children under 12 years will be charged INR 555 per night for breakfast. It is a well constructed resort. Which was very poorly managed. Very poorly. Food was atrocious. The display was very bad. Rooms dusty. Frankly speaking. Good property being poorly managed. May be cos of lack of staffs or poor management. I visited them during 2017; now they increased the price 40% and removed lunch from the package. Even After 50% increase, I found there are less variety in buffet, less staffs, unhygienic pool, poor reception staff, no covered parking (even open parking, they will not hold any responsibility), etc. windflower in 2017, but turned to wind in 2019, the flower is missing. The walkway around the property - steps not marked, I missed my step so many times I wonder how the older people managed ! The rooms .. the room we booked said mini bar , slippers etc- ours didn’t have either and when we enquires they sent a mini “cooler” which was EMPTY!! Nothing stayed cold infact it was like an oven !! Kept everything inside nice and hot!! And slippers were not provided!! The towels in the bathroom- like using sandpaper on your body ! You didn’t need to go to the spa to get a good scrub .. just use the windflower towels! The fancy throw cushions on the bed - reeked of body odour ..never been cleaned I guess! The pillows - was like sleeping on 5 normal pillows.extremely uncomfortable! The extra pillows in the cupboard in the toilets had no covers ! When we called room service for lunch on day 1 we were abruptly informed to go to the banquet hall ! Yes we do know you had a group but isn’t it better to enquire first before being rude to your guests ? ?we were not part of the group! The bedsheets were stained as well as the pillow covers! The phones didn’t work and I had to repeat myself constantly because the person at the other end couldn’t hear me !! The swimming pool lounge chair cushions filthy and falling apart! The towels again like sandpaper! The spa .. while the massage was good the shower stall water didn’t drain and the bathroom was flooded while I took a shower and I was standing in ankle deep water !! When I asked for another room for the massage then next day they said all the bathrooms are the same !! The kitchen and dining area need a complete overhaul as well ! Il was looking at older reviews and was surprised to see the same issues almost 3 years later ! It doesn’t take a genius to realise that you should not book windflower resorts and spa !!!! The so called 4 star rating is all rubbish .. I’d give this place a 1.5 star just because a few of the staff were pleasant ! It’s an eye wash ! You walk in see the landscaped garden and that’s it ! It all goes down hill from there ! Too many oily starters.Food is ok.Not so good in taste. 1. Pillows in room too high. There should be a door to the WC. No exhaust fan in the bathroom though provision exists. 2. The TV has very less channels for Hindi and English speaking people. The remote would not work at times..There should be list of all channel numbers in the room 3. For the size of the room and bathroom, the lighting is less. 4. There is sewage smell outside the room during entry. Better cleanliness is required . Cobwebs outside the door. Towels had stains. 5. Food was just ok . A better choice of food items could be there. If one stays for three days as we did, one ends up having the same food items at all meals. Bakery items need a big improvement. Rooms are big and nicely decorated. The garden is really nice. Staff is kind and smiley. Just overrated for pondicherry. Breakfast is really okay. Property is not that maintained. They have a lot of repairs to be done. Room space is large for a studio room. Beds are good. Nice balcony with a hugs couch. Food was just average have to improve a lot. Can take a cue from your Bandipur property. The room & bathroom was clean & spacious. Overall a good experience. Bugs everywhere. Saw a cockroach near the dinner buffet. Lots of mosquitoes and bugs . Can’t sit out and enjoy the outdoors without being bitten Remote location. Way too expensive for the services provided . Room rate was very high but it was a let down with services and other entertainment provided in the property .